Conrad has a personal connection to camouflage technology, as his father was involved in the design of the U.S. Navy’s dazzle camouflage technique. His point, to a certain extent, is that camouflage determines a relationship within the world: it creates a form of perception as much as it seeks to abolish the very possibility of perception. If camouflage is designed as a facilitator of invisibility, it also retains a contradictory status as something admirable, recognizable, and even bold. 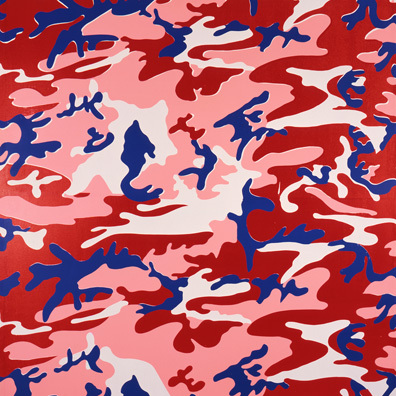 Far from generic or free of association, camouflage is loud, communicates multitudes, and is frequently invoked in discussions of art ranging from Cubism to Warhol. Still, camouflage is best known as a military technology of concealment, and it’s an effective one. From what or whom, though, does camouflage conceal? 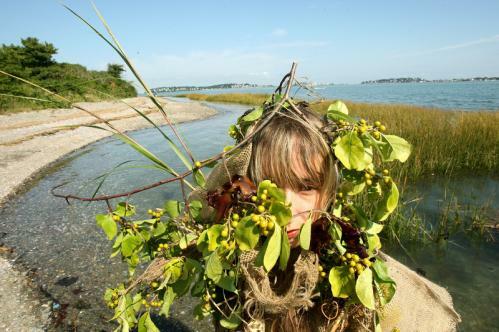 Hide and Seek: Camouflage, Photography, and the Media of Reconnaissance, Hanna Rose Shell’s recent book concerning the history of camouflage, traces the development of this recognizable form of hiding and reveals the expanse of impulses behind its development. As opposed to the social-psychological relationships created by camouflage, Shell focuses on camouflage’s relationship to popular and military technologies of reconnaissance and detection in the 20th century. While countless studies proliferate concerning the ontology of filmic and photographic images, Shell’s follows the specific thread of camouflage in tandem to those developments. Rather than focus only on camouflage as an attempt to blend into a physical environment, Shell emphasizes camouflage’s consciousness of visual technology since its emergence in World War I, when aircrafts were first widely used as reconnaissance tools and eventually refined as bombing machines. Previous wars had utilized human eyes to scout enemy positions, but as soldiers on the ground saw planes with affixed cameras flying overhead, camouflage became a nifty form of concealment within the frame of the photograph. Embedded in this discussion is photography’s transformation of society’s understanding of temporality. Abbott Thayer, an early and controversial analyst of concealment strategies utilized by birds and other animals, focused his thinking on the crucial moment of hiding. Natural camouflage techniques, Thayer suggested, were not designed to keep animals constantly hidden, but rather allowed environmental blending during moments when an animal needed to be made invisible. Former President Teddy Roosevelt pointed to the flaws in Thayer’s thinking by suggesting that no Zebra stood still by their watering hole waiting to be unseen. While Thayer’s attitude towards the momentous may have been shortsighted for a discussion of the animal kingdom, it was undoubtedly prophetic for the development of military camouflage and it’s relationship to photographic technology, as illustrated by the similarity between Thayer’s crucial moment of concealment and Henri-Cartier Bresson’s influential photographic theory of the decisive moment. In World War Two, as photography took its rightful place as the ultimate intelligence-gathering tool, film was becoming increasingly popular as a means of training personnel, and the cinematic model of spectatorship itself became a training ground for pure, invisible perceptive practice. Shell focuses on Len Lye’s WWII training film Kill or Be Killed. The viewer of Kill or Be Killed is thrust into a war-torn natural environment by the aesthetic mode and narrative form of the film, which prefigures the “first-person-shooter ethos that marks both recreational gaming and military training devices” (133). Kill or Be Killed became a visual embodiment of the relationship between human hiding and visual technologies. It film prefigured the way in which, as the 20th century marched forward, potentials of visuality increased through technological mediation and those technologies became the spaces in which the distinction between being seen and unseen was perfected. The hero of military camouflage modes during World War Two was the sniper, a demigod of WWII mythology. Snipers embodied the ultimate camouflage goal: seeing everything though the lens of your weapon while remaining completely unseen. In popular war movies like Enemy at the Gates or Saving Private Ryan, snipers retain a privileged position among soldiers based on their exemplary invisible status. The sniper remains a relevant model for spectatorship, as the increase in recorded material requires an often-elusive ability to snipe information from gargantuan amounts of footage, in a contemporary reenactment of the crucial moment imaged by Abbott Thayer. The filmmaker Hollis Frampton once declared that the invention of radar marked the end of the Age of Machines by replacing “the mechanical reconnaissance aircraft with a static anonymous black box.” Radar, a system of visualization divorced from observation and based on detection, required new “chameleonic impulse” (one of Shell’s most addicting terms), such as the development of stealth. Radar does away with a mode of seeing that mimics human visuality (photography) and instead makes humans interface with a purely technical form of recognition. Though Shell’s study doesn’t move into this pure arena of perception/detection, she does bring the “chameleonic impulse” into the present by touching on the dream of a technology that could function like an invisibility cloak, which remains reliant on eluding not human eyes, but human technologies of vision. With increasingly complex forms of surveillance and detection, new methods of camouflage continue to emerge as counter-inventions.